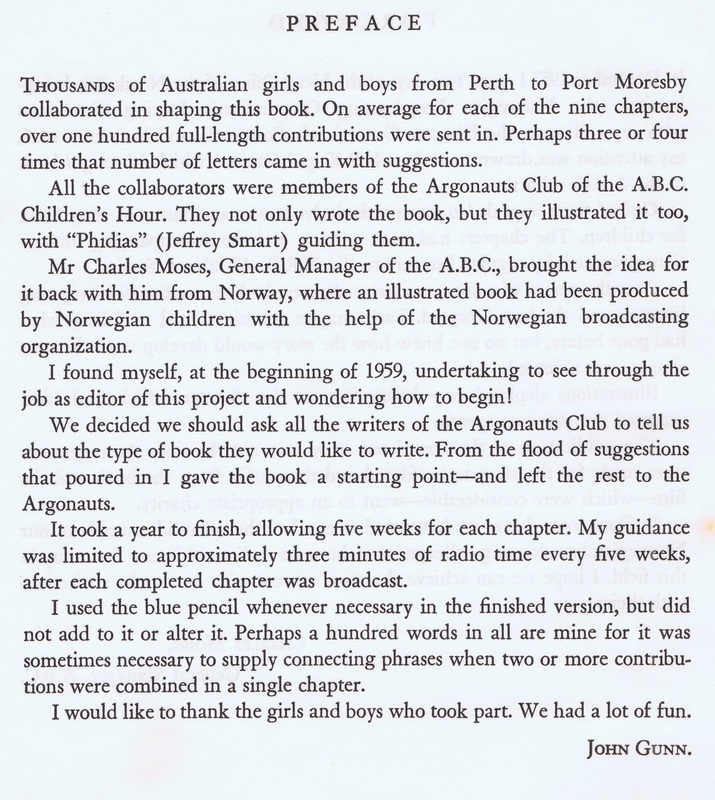 The Argonauts Club on ABC Radio would have to have been the longest running Radio Club in Australia. I wasn't a member, to my lasting disappointment. I was however, a listener to the session, but never a member or a contributor. I remember asking my Mother at one stage about joining, but I don't remember the reply apart from it obviously being a no. I guess at the age I am remembering this, I was more attracted to listening to The Muddleheaded Wombat stories that were a part of the session. I grew up on Ruth Park's stories, still have Muddleheaded Wombat books that have been through my children and now the grandchildren. I also have cassettes of the stories they released from the session and they bring back memories when I play them. I wonder if I can get the ABC to approve having one of the stories here. They have given me permission to use material not from their commercial sources, which these are, so I will follow up on that. 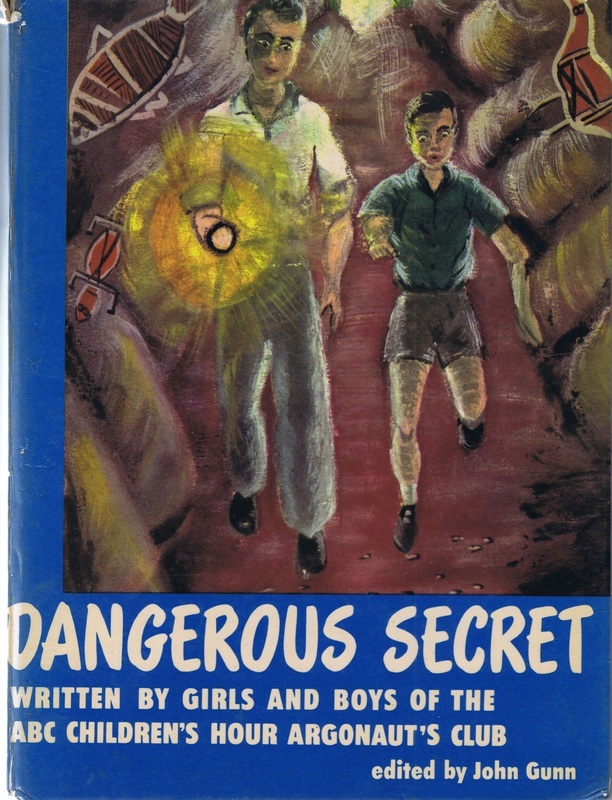 The Argonauts was a National Children s session for ages 7 to 17 and the children participated by sending in drawings, paintings, poetry and stories and receive points that went towards gaining awards. When the child joined, they were allocated a ship name based on Greek Mythology and a position at an oar. They were sent a badge and a certificate containing an oath which they then signed. 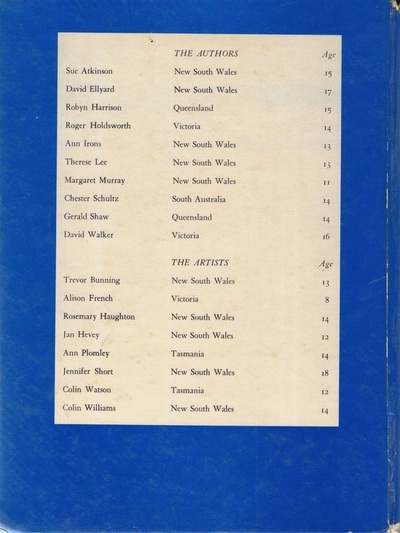 The only membership numbers I have read, say there were 100,000 Australian children as members at its height in 1950. Obviously with members leaving at age 17, the actual number of children who actually joined the Argonauts was a lot higher than the 100,000 but how much higher? At this stage I can't think of a Radio Club that lasted as long as the Argonauts, though Smoky Dawson and Kellogg's Wild West Club probably would have beaten them in membership numbers of 1 million. The Argonauts officially kicked off mid1933 and finished April 1972, that is a very good run but as you will read further you will see that they had dedicated on-air and off-air staff who recognised their audience and really put in the effort. This section has only just started construction, so visit regularly to see what I add. Apart from the items I will place in a slideshow for you to see, I will include the Argonauts theme as it is something I am probably asked for most often. I also have a rather interesting scrapbook that had been kept by a big fan of the session. It has newspaper cuttings from the ABC Weekly and other sources where Argonauts were mentioned. The owner also included ship names and positions for people in the scrapbook which makes it even more interesting. I will scan the book and include each page here along with the owners captions added to the pictures. So hang in there and enjoy what I include here while it is under construction. If you have your own Argonauts stories, please send them to me via the contact form in the menu. Dangerous Secret was a book where all members of the Argonauts Club were encouraged to contribute a chapter in a continuing story. Nobody knew how the story would progress or finish. As I have mentioned in other sections, I am very interested in the Radio Clubs and their badges. The Argonauts Club has quite a selection. 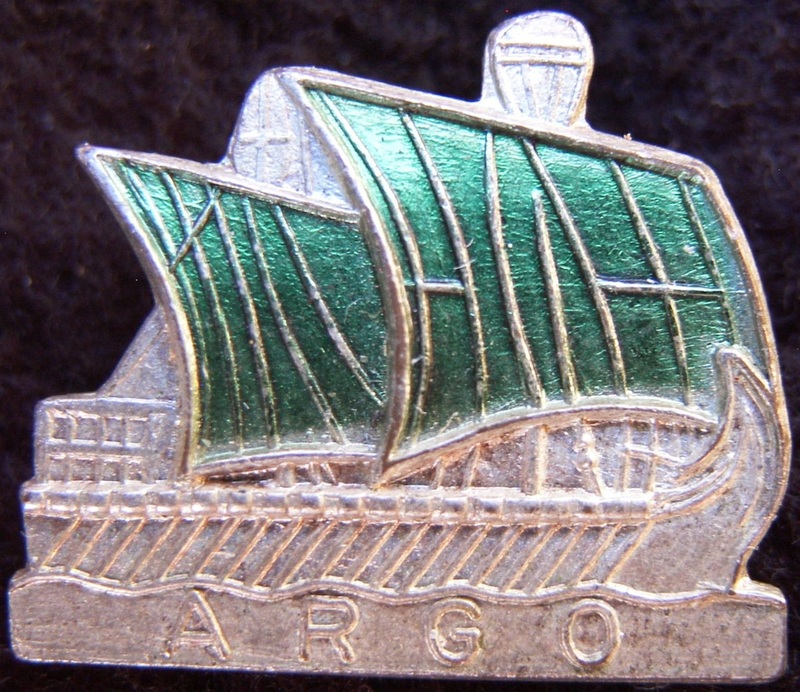 But so far I have not been able to work out how the different styles of Argonauts badges have come about. In the pictures above, you see representatives from my collection. The first appears to be the oldest and it is actually a pin with quite a long shaft on the pin as was the style. On the reverse, the manufacturers name PJ King is embossed. PJ King was a Melbourne badge manufacturer. The 2nd badge is the standard ARGO badge with manufacturer Angus & Coote embossed on the reverse with the usual clasp. There are slight differences such as above the oars and the quarterdeck at the rear. It is actually the same colour as the first badge, but with different patina. The 3rd Badge is different around the quarterdeck and introduces enameled sails and is made from a light alloy. It has no manufacturers details on the reverse and it has a standard clasp. Its not a one-off as I have several. The 4th is a red button made of metal, no manufacturers details and uses the standard button springed pin arrangement. I am used to pins and badges varying from manufacturer to manufacturer when new orders were placed. But these are not minor differences. 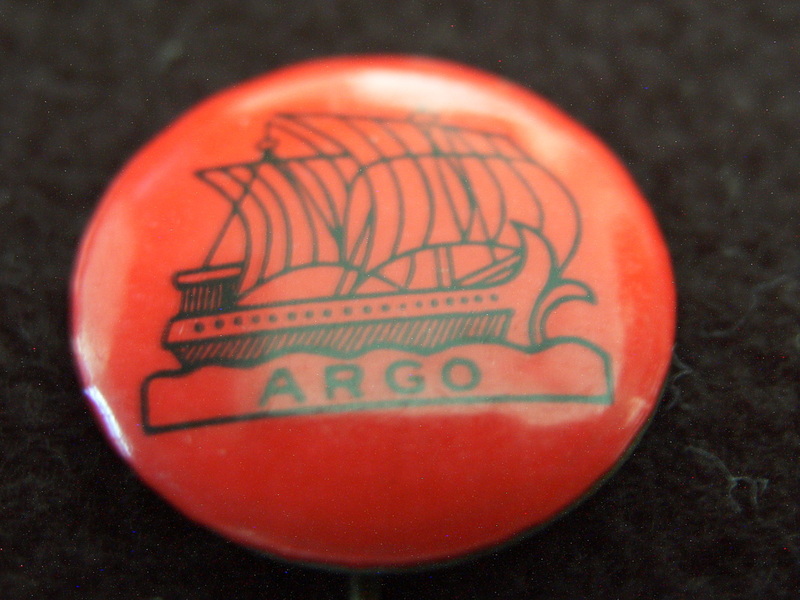 The Argonauts were Sydney based and the 2nd badge is the one I regularly see and have a few of in my collection. I find it intriguing that the first one was Melbourne manufacture and Pin style. There is talk that The Argonauts started in Melbourne and then shifted to Sydney when it became a National session. 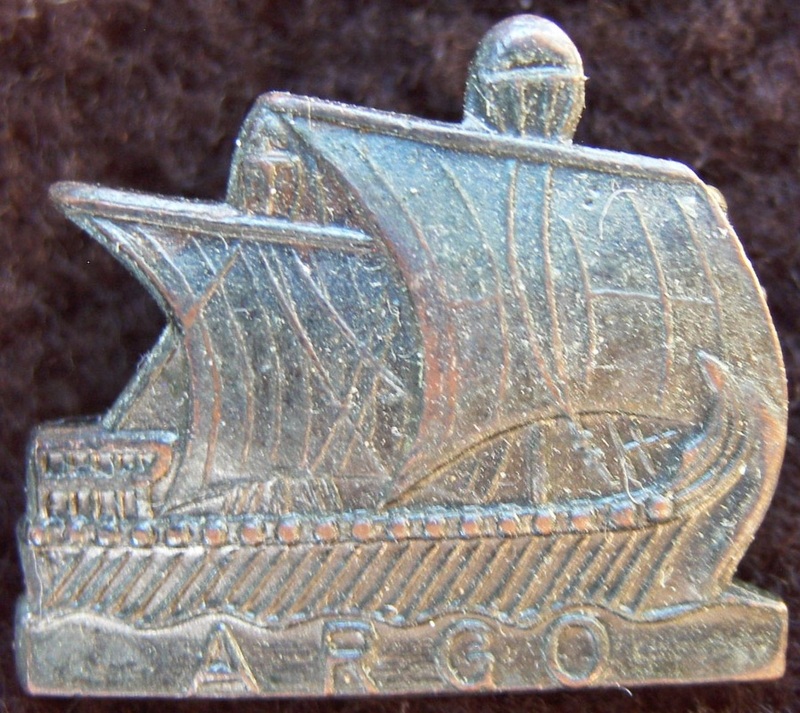 Was this the first Argonauts Badge/Pin? Or was it as simple as them needing badges in a hurry at some stage and it was quicker to get some from Melbourne? 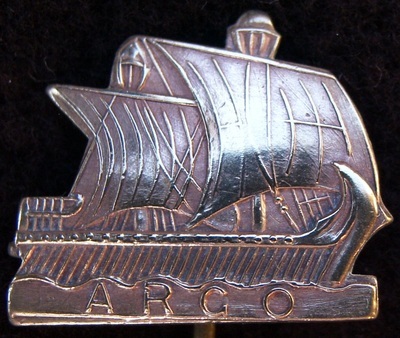 The only way I am ever going to know is if Argonaut members tell me which badge they got and when. Then I can work out the timeline for these badges. The books on The Argonauts only show the standard Argo badge, not these variations I show you above. 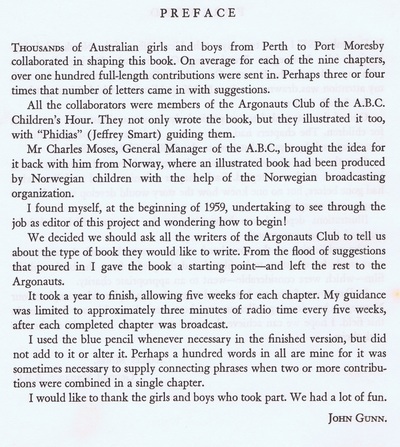 I supplied copies to the ABC about 5 years ago when they were working on a story about The Argonauts Club, but I never heard back and never saw or heard the show. Then there are the other two badges I am seeking. In the paperwork I include in the slideshow, there are representations of The Golden Fleece badge and the Dragons Tooth badge that members earned. To say they earned them is an understatement. A lot of hard work went into achieving those badges. Sadly, I have never found examples of them. Its not sad if those who achieved those badges kept them safe and passed them on to family who understood the significance, but it is sad if they are going into landfill because descendants don't recognise the effort or importance of those badges. One more reason for the existence of this website.